The 2012-W $50 American Eagle Gold Uncirculated Coin is struck by the United States Mint as part of the larger American Gold Eagle Program. The program itself dates back to 1986 with both proof and bullion varieties, but the uncirculated versions were not added until 2006. 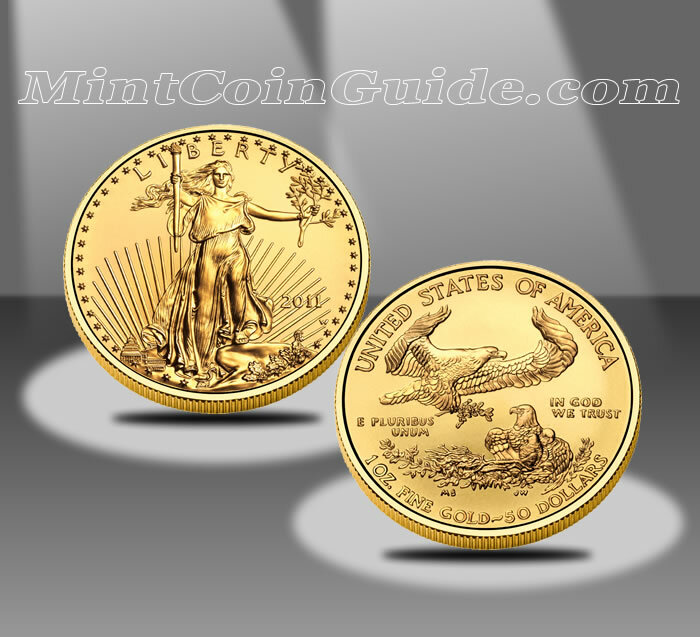 When first introduced, the American Eagle Gold Uncirculated Coins were struck in four sizes just like their bullion and proof counterparts – one ounce, 1/2 ounce, 1/4 ounce and 1/10 ounce. However, in 2008, the US Mint discontinued the fractional sizes leaving just the one ounce uncirculated Gold Eagle. Also, in 2009, the US Mint cancelled production of the Uncirculated Gold Eagle along with the Proof Gold Eagle as it struggled to meet demand for the bullion version. The cancellation remained in effect for the Uncirculated Gold Eagle in 2010 with their return finally occurring in 2011. * Unofficial, un-audited figures based on US Mint sales. Uncirculated Gold Eagles are struck from 22-karat gold. A release date for the coin is not yet known. The Mint utilizes a pricing matrix for the cost of the gold Eagles which links the price of the coins to the average of the London Fix for gold the previous week. A "W" mintmark found on each coin indicates it was struck at the US Mint’s facility in West Point. Augustus St. Gaudens Liberty is seen on the obverse of the coins. It was first used on the 1907 Double Eagle and is considered by many to be one of the most beautiful designs ever struck on an American coin. The reverse (tails side) shows a flying eagle over a nest containing the eagle’s family. It was designed by Miley Busiek.